As there was Zibelemärit (onion market) in Berne, Switzerland yesterday, Zorra from 1 x umrühren bitte blog has declared 26th November as an Onion Day. She invited food bloggers from all over the world to join the celebration by preparing a dish with onions on 26th November and blogging about it today. Even though I’m not a big fan of onions, there’s one onion recipe I absolutely love! 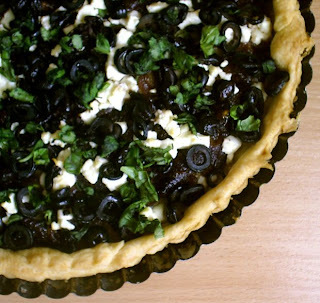 The dish is Red Onion, Feta and Olives Tart and it’s definitely the best savory tart I’ve ever had!!! The first time I tried this recipe though, it wasn’t that good at all. The mistake I made was omitting balsamic vinegar. I didn’t have balsamic vinegar at home and thought it would taste fine without it too. Well, it didn’t. It turned out that the vinegar was really an essential ingredient in the tart, as without it, the onions came out too sweet. This time, however, I followed the recipe and the result was amazing. The vinegar balanced the sweetness of the onion and sugar mixture and the tart came out delicious. The combination of flavors of sweet (but not too sweet this time) onions and savory feta and olives is absolutely genius. The recipe comes from the Polish edition of Good Food: 101 Veggie Dishes cookbook and asks for ready puff pastry. I made the pastry myself using Nigella Lawson’s Processor Puff-Pastry recipe from How to Be a Domestic Goddess, I altered the recipe slightly by omitting the lemon juice though. The pastry came out great: buttery, flaky and tender. Melt the butter in a large pan. Add the onions and season to taste with salt. Fry for 10 minutes until golden and soft stirring occasionally. Add sugar and balsamic vinegar, and cook for a further 5 minutes until the juices are reduced and syrupy. Leave to cool. Roll out the pastry on lightly floured surface. Lightly grease 25 cm (10 inch) tart pan, then line with the pastry. 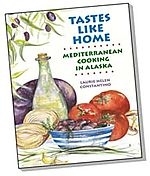 Cover with the onion mix. Scatter the feta and olives over. Drizzle the olive oil over the topping. Bake for 15 minutes or until the pastry is risen and golden and the base is crisp. Top with the basil. Serve with green salad. Pulse the flour and salt together in the processor, then add the butter and pulse 3-4 times, the pieces of butter should still be visible. Add the iced water, and pulse till the pastry begins to form a ball, then form a ball with your hands. Wrap in plastic wrap and refrigerate for half an hour. Dust a surface with flour, roll the pastry out into a long rectangle, and fold it in three like a business letter.Now turn the folded pastry so that if it was a book the spine would be on your left. Repeat twice more, turning every time. Wrap in plastic wrap and refrigerate for another half an hour before using it. * This makes enough for 2 tarts, so you may need to scale the recipe. This tart suits my taste! Lovely looking tart. You can never go wrong with a combination of flavors like that. This looks absolutely delicious, thanks! I make an onion tart using cider vinegar, but I bet balsamic would make it taste even better. I was also very happy to read the simple puff pastry recipe which I'd never seen before. Thanks! Zorra : I’m glad you like it. Thank you for organizing the event, I was very happy to participate!!! Cenk: Thank you!!! I’m very happy to see your comment on my blog. I love your Cafe Fernando and read it regularly!! !